JDC - Archives : Abraham Staiff, a survivor of the Auschwitz concentration camp and a post-tuberculosis patient, pursuing the carpentry trade in Norway, where he permanently resettled after the war. 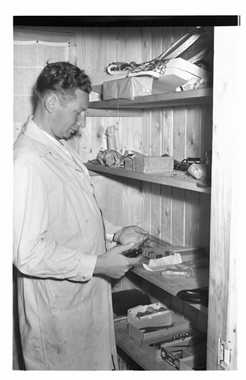 Title Abraham Staiff, a survivor of the Auschwitz concentration camp and a post-tuberculosis patient, pursuing the carpentry trade in Norway, where he permanently resettled after the war. Description Abraham Staiff [Steiff] survived the Auschwitz concentration camp. At the end of the war, he was treated by the JDC-supported hospitals and rehabilitation centers for tuberculosis while simultaneously learning the carpentry trade. He settled in Norway, where Jewish DP's with tuberculosis or post-TB patients can find a new home even with their medical history. He will pursue the carpentry trade in Norway as much as his health allows.